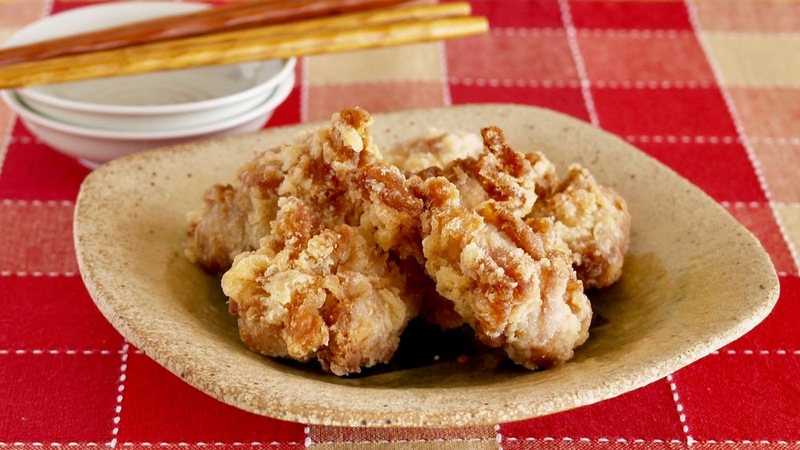 Karaage (also called Tatsutaage) is Japanese fried chicken. It is usually cooked for lunch, dinner, or bento. Also, it is the best party recipe favored by most people! 1. Remove unwanted fat but leave the skin of chicken (because the skin makes the chicken crispier!) and cut up into bite-size pieces. 2. Put the chicken in a bowl, add A and marinate for 30 minutes. 3. Drain well and mix beaten egg. Then mix B. 4. Fry them in oil at 170C (338F) for 5 minutes. Then turn to 190C (374F) and cook for 20 seconds to fry to a crisp golden brown.